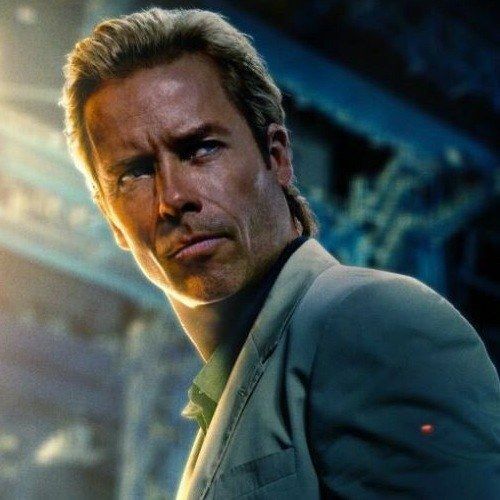 Disney and Marvel Studios has released the third character poster for director Shane Black's Marvel Phase II sequel Iron Man 3, which features franchise first-timer Guy Pearce as Aldrich Killian. In the film, Killian works alongside Maya Hansen (Rebecca Hall) in harnessing the power of nanotechnology, which Tony Stark (Robert Downey Jr.) will use as Iron Man to defeat the nefarious Mandarin (Ben Kingsley). "Dr. Aldrich Killian (Guy Pearce) is a brilliant scientist working for the FuturePharm Corporation in Austin, Texas alongside Dr. Maya Hansen (Rebecca Hall). Together they developed Extremis, an attempt to create a new super soldier. The Extremis is a techno organic virus that completely rewrites the body's genetic code. It replaces entire organs making them more efficient. The virus also gives the body a sort of healing factor. The original Extremis grants super human strength, speed, endurance, reflexes and the ability to project electricity and breathe fire. He steals a sample and sells it to a terrorist group. The group, based in a slaughterhouse in Bastrop, Texas, injects a willing test subject called Mallen. A bizarre physical change overtakes him; his horrified compatriots flee the room but lock him in it. The injected man's body, still lying in the Bastrop warehouse, is now covered completely in a bizarre layer of scar tissue. Days later at Futurepharm Corporation offices, Dr. Aldrich Killian commits suicide at his computer; his suicide note informing co-worker Maya Hansen that he has stolen the Extremis serum for an undisclosed purpose."